Over the last decade, we have been inundated with research claims all saying how sitting is bad for you. Many articles are circulating with titles such as Sitting is Evil, Sitting is the New Smoking and even Sitting will Kill You. The truth is there’s nothing wrong with sitting. The real evil is NEVER moving. Most studies that report on the dangers of sedentary behavior only look at how much people sit, not how much they don’t move. By putting the blame on sitting, we lose focus on the real issue, which is lack of exercise. SIGN UP FOR A FREE FITT CONSULTATION AND GET MOVING TODAY! The body adapts amazingly well to the forces and stress that we apply to it throughout the day. Sitting all day can still be harmful, your body will lose mobility to areas like your hips, hamstrings and thoracic spine, and it can lead to health issues such as back pain. 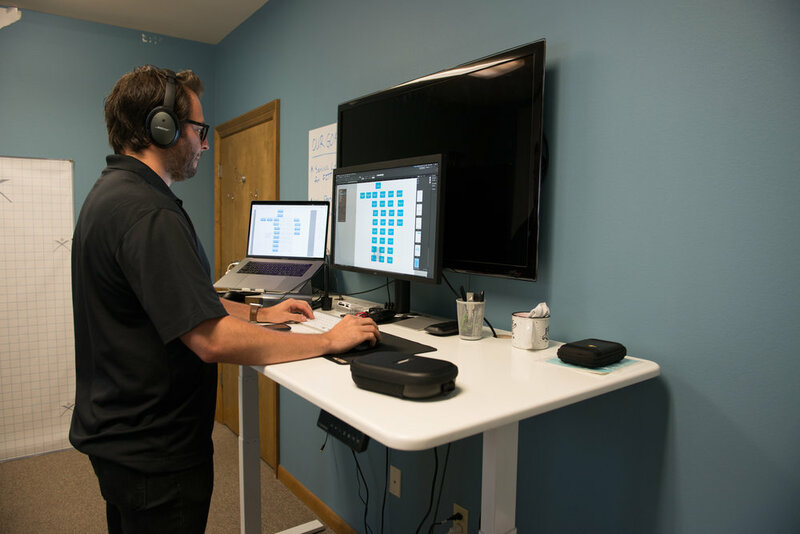 So, we’re seeing a shift in people switching to stand up desks at work, but they’re still not exercising or moving throughout the day. Standing too much can compress the spine and lead to lower back problems over time. It can also boost your risk for carotid arteries, varicose veins, deep vein thrombosis and other cardiovascular problems since the heart has to work hard against gravity to keep the blood flowing up from your toes. Get moving! It’s best to break up long lengths of sitting or standing with exercise and stretching. Schedule a FREE FITT consultation where your previous and current injuries, complications, problems, experiences, and achievements are all taken into consideration to better understand where you are and where you want to go with your health. Our FITT trainers will then evaluate your body using Kinesics Evaluation Software and assess your body’s imbalances, weaknesses, and asymmetries to pinpoint hidden sources of your functional limitations. With these evaluation metrics, they use an extensive database of flexibility and mobility exercises to create a personalized program for you to do at your own pace. These exercises are perfect to break up the length of time you are sitting or standing at work. Make a habit of taking a few minutes to do these exercises throughout the day and it will completely eradicate any of the supposed risk factors associated with sitting or standing.